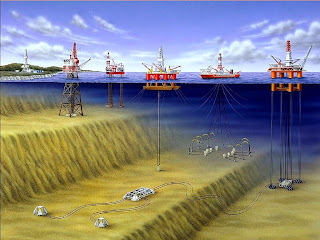 different depths and at remote positions up to 8 kilometres from the platform. or a manifold centre for multiple wells. installation in water depths up to about 1,700 feet. structure to float, but of weight sufficient to keep the structure upright. they can also be kept in place by the use of steerable thrusters. Semi-submersible can be used in depths from 200 to 1800 meters. place, and then anchor themselves by deploying the jack-like legs. cause the drill string to break. Platforms are used in water depths up to about 1500 meters. bottom and does not depend on the mooring to hold it upright.